Blue Planet had a booth at the Outdoor Retailer show, August 3-6 in Salt Lake City, right after the Molokai to Oahu race. 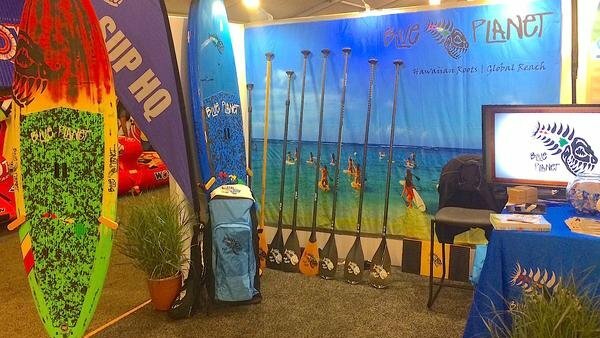 This was our first time to the show so I have nothing to compare it to but I was impressed by the scale of this outdoor recreation business trade show and by the booths of some of the SUP companies that were at the show. We displayed our Blue Planet gear in a small, simple 10x10 booth as part of the Hawaii Pavilion. We were stoked to be part of this show and we did a lot of networking. It seemed like most of the VIP's in the industry were there and it was worthwhile for us to represent our brand. I also walked around the show a bit and shot some video interviews of products that caught my eye whenever I had the chance. Sorry about the poor audio in some of the videos, there was a lot of background noise at the show. Links to the products in the videos are below. He also shares some tips for downwinders- how to catch, surf, and connect the bumps- learn from the master, thank you for the interview and tips Oscar! The third video is of John Kleckner talking about the Catamaran fishing SUP's made by his company, Live Watersports. These double hulled Standamarans are surprisingly stable and have good glide and seem to be ideal for fishing and cruising. They also offer lots of accessories for fishing and touring, making these very versatile all-round Stand Up Paddle cruisers. John Amundson was showing off the line of Amundson Hawaii boards. He goes over the new features of the 2017 14' TRX Stand Up Raceboard model, which looks really nice. John has been designing the Amundson line of SUP's for a long time and has recently taken on more responsibilities, good work John! Sean Sweet of Sweet Waterwear and Kimberly Schamber or SUP Merge collaborate to create Sweet Kiss, a new line of Stand Up Paddle specific clothing. I talked to them at the Outdoor Retailer Show in Salt Lake City, August 2016 about their new lineup, which will be in stores soon. That's it, I hope you enjoyed these videos of things I found interesting at the Outdoor Retailer show. As always, please give us the thumbs up on youtube if you enjoy our videos and subscribe to our channel and we will keep new videos coming every week.